Myanmar will go to the polls on 8 November in its first open general election in 25 years, officials say. The vote is seen as a crucial next stage in steps towards full democracy.Myanmar’s opposition leader Aung San Suu Kyi has said the National League for Democracy will contest polls set for Nov 8. 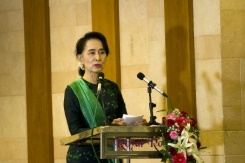 “We have decided to take part in the election,” Suu Kyi told reporters at a press conference at her residence in the capital Nay Pyi Taw, vowing the party would “amend the constitution” that bars her from the presidency if it wins the polls.The Reform in Myanmar has been under way since 2010 when military rule was replaced by a military-backed civilian government.